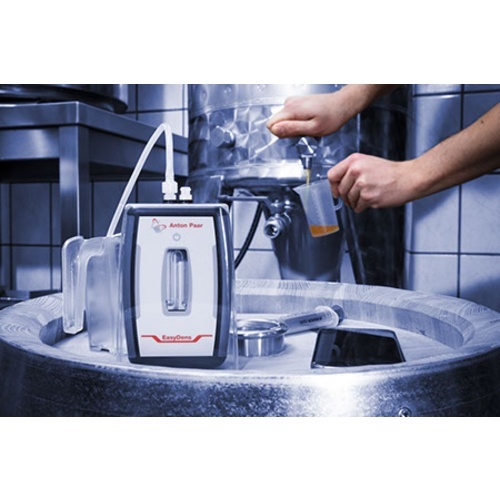 Anton Paar is a leading producer of analytical testing equipment for commercial breweries. Borrowing some technology from their high end machines, the EasyDens digital gravity/alcohol tester is designed for savvy homebrewers and small commercial breweries. 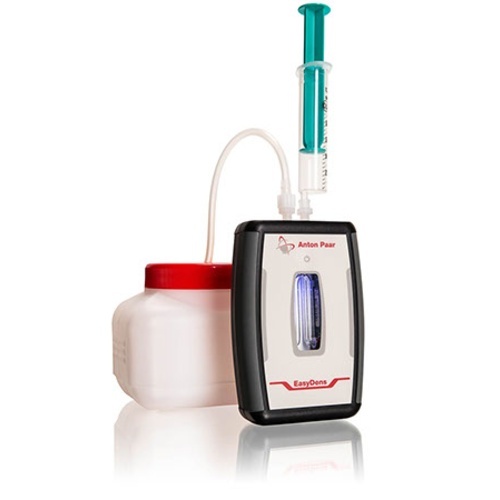 It is a precision gravity/density testing unit which can accurately read gravity with a tiny 2 ml sample at any point in the brewing process. 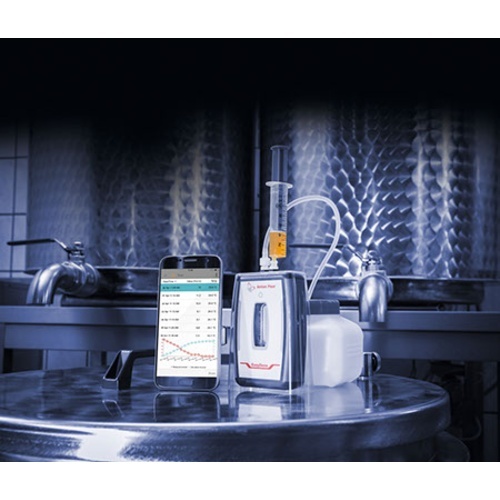 Alcohol % can also be tracked at any point during fermentation. The unit hooks up to your smartphone via Bluetooth and stores various fermentation "profiles" enabling you to track fermentation progress, alcohol levels, and help know when it's time to keg & drink your beer! See the documents tab for frequently asked questions about the Easy Dens. I own a distillery back in Brazil. Saw it at HomebrewCon 2017. The price came down. Great technology and a great price. This is the next step for the serious homebrewer looking to take his brewing to the next level. Best price I could find on the web. 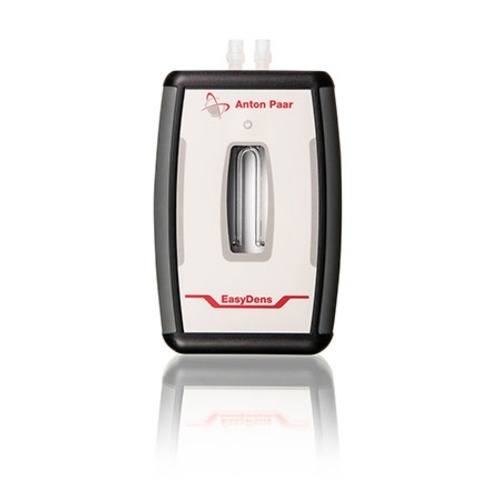 The EasyDens is so easy to use and I love that it only needs a very small degassed sample to work. Highly recommended! Super easy to use. Links up quickly and painlessly. Accurate and totally worth the money if you plan on using it in a semi or professional application. The absolute best way to measure and track gravity samples! If you want the best and are willing to spend the money, there is no better option! This thing is very quick and easy to use! I find it especially helpful on small batches where pulling an multiple hydrometer-jar-sized samples isn't practical. Very easy to set up and use. Readings clear and consise. I like the small amount of wort needed to take a reading. I would recommend this to anyone considering purchasing it. My gravity readings have always been hit and miss with my refractometer due to calibration and temp. I really didn’t think this would work as well or as easily as it does. I gave it a shot and it really is one of the best tools I have purchased. Up there with my ultimate conical, just much less expensive. I take readings now just for the hell of it. Highly recommended if you got the scratch. Accurate as hydrometer and smaller sample required. Easily calculate apparent attenuation. Not excited that some of the calculations are locked and cost extra. You would think at this price that it would come fully functional. App doesn't work on Windows 10 tablet. Works on newer Ipad. The EasyDens works great!! Fast, easy, accurate. I know its a little pricey but this device makes taking gravity readings a pleasure. Small sample sizes, no mess, straightforward reading on the smartphone app. Just awesome. If you can splurge the cash - Get One! It is an easy tool to use and there's no guessing for your gravities! And no more broken hydrometer. Really love this little machine! The best instrument For measuring extract and SG, work equally good measuring alcohol levels after distilling finished beer. Cheers!!!! Wanted this since HomeBrewCon 2017. Pulled the trigger when I saw Morebeer's price. Easy to make measurements while beer is fermenting. Just run a tiny amount through a coffee filter and de-gas. I use the pull-vaccuum-with-syringe method. Be aware, I had to delete the Fitbit app from my Samsung S7 as it was causing the Easydens app to repeatedly disconnect/re-connect. I also deleted a Plantronics 'Find my headset' app so it could have possibly been that. We really like the ease of use and simplicity of the Easy Dens. It's a great tool for a small brewery. 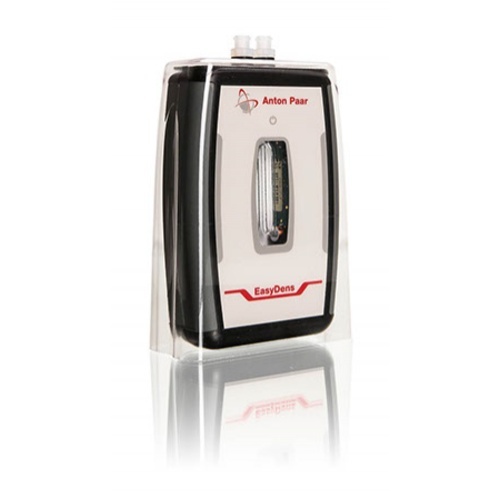 The Easy-Dens meter is user friendly and provides accurate measurements. Brewing on a small scale, I have much less waste involved with Easy-Dens than a traditional hydrometer. I would highly recommend having one on hand. Fast, accurate readings. Easy to use with multiple samples. The EasyDens lets me take daily readings of my beer and mead with out pulling large hydrometer samples. Pulling 20ml per day I can get the gravity readings and I know where my fermentations are. No more guessing when to cold crash or transfer. Fantastic product and definitely worth the money if you are looking to make a step to more consistent brewing. However, it is a little cheeky of Anton Paar to ask for additional payments to unlock features in the App. I think the device is brilliant, but it would be amazing if all the functions were available at a fixed cost. I was hesitant at first as I was going after the DM35. I have since seen the cheaper EasyDens at some breweries and decided that it would be the way to go. I have used refractors in the past (manual & auto) and found that the readings fluctuated between samples. EasyDens uses a frequency method to determine the density and does not rely on refraction of light. To fully understand the easyDens, I suggest that prospective purchasers read the AQ and manual first as there are some things that are not mentioned until one has the actual unit. EasyDens defaults to reading SG and density (m/v). It has other units Brix, Plato, Alcohol. Only one of the latter can be enabled for free. I set mine to Plato, and then I would have to pay extra for Brix. I am happy with the unit and would recommend it it. Very easy to use. It is accurate and also display the sample temperature. Has the ability to plot graphs of gravity, i.e. fermentation progress. Can be used in presence of alcohol. Expensive, cannot measure alcohol, and finding that additional units for displaying were in App purchases did not go down well.